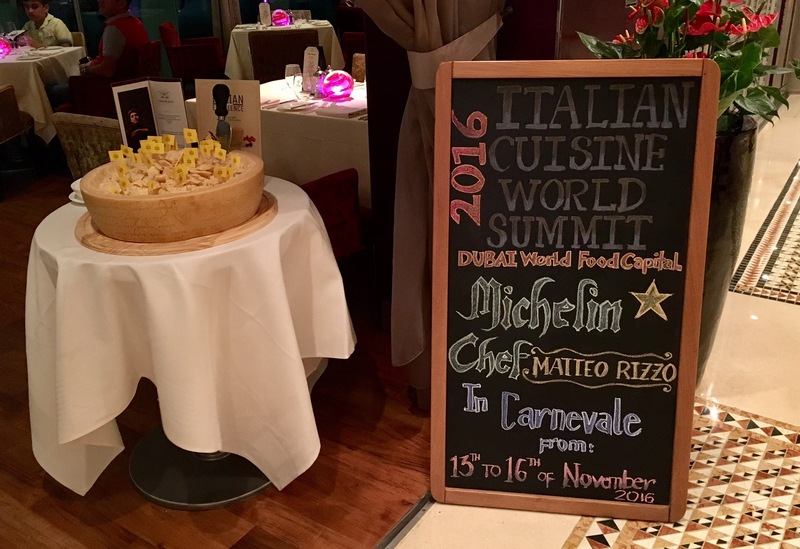 Last November, I was invited to an exclusive dinner at Carnevale to preview their menu which was served for the Italian Cuisine World Summit. As Italian cuisine is one of my favorite cuisines, I was looking forward to my dinner at Carnevale. Situated in the iconic Jumeirah Beach Hotel, Carnevale is one of the many restaurants in the hotel. The restaurant offers a great view of Burj Al Arab and the tranquil gardens surrounding the hotel. The eye catching marina collectively completes the perfect dining experience. The indoor dining area has a typical European set up. As the weather was beautiful, we sat outdoors. While it offers amazing views, the seating area is quite cramped and as we were given a table close to the entrance, we couldn’t enjoy our meal as there was too much disturbance, whenever people entered or exited the restaurant. Our dinner started with their bread basket, butter and dips. I would advise them to serve freshly baked bread and their own butter rather than a packaged one. For our drinks, we had two of their mocktails. It was the regular ones, nothing exceptional. As their menu for the Italian Cuisine World Summit mostly offered non vegetarian dishes, we being vegetarians had to order from their regular menu. 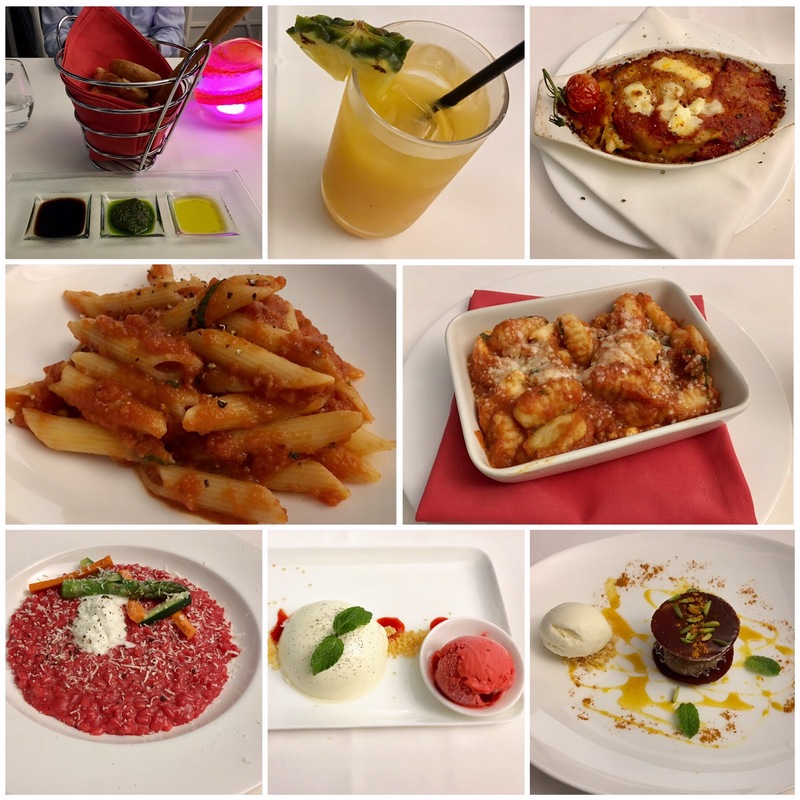 For our first course we ordered Eggplant Parmigiana and Penne Pasta with Arrabbiata sauce. The Eggplant Parmigiana was over cooked where as the pasta was under cooked and difficult to chew. The second course was Gnocchi with red sauce and Beetroot Risotto. While the Gnocchi was normal, but the creamy and delicious Beetroot Risotto was amazing. The third course was the dessert and we ordered the Panna Cotta and Tiramisu. The Panna Cotta was served with raspberry sorbet and it was good. The Tiramisu which was from their Italian Cuisine World Summit menu was outstanding. It was presented in a unique way and tasted as great as it looked. Dubai has many excellent Italian restaurants and Carnevale has to improve their offerings to reach those levels.